Some time before his accession, Prince Amenhotep, then hardly more than ten years old, was married with all the customary pomp to a little princess of about eight or nine, Nefertiti. Scholars do not agree about the bride's parentage. Sir Flinders Petrie identifies her with Tadukhipa, daughter of Dushratta, king of Mitanni. Arthur Weigall rejects this view on account of the princess's "typically Egyptian" features, and supposes her to be the daughter of Ay, a court dignitary, while the striking resemblance between her portraits and those of her young husband has prompted others to suggest that she was his half, or even his full sister. Brother and sister marriages were common in Egypt, as everyone knows. We have no opinion to express on the subject. 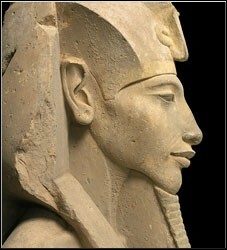 Yet, we find it difficult to dismiss Sir Flinders Petrie's version on the sole ground of Nefertiti's looks. For, if the princess were indeed the daughter of Dushratta, then her mother would be the sister and her paternal grandmother, the paternal aunt of Amenhotep the Third, while the prince's paternal grandmother -- the chief wife of Thotmose the Fourth -- was, as we know, Dushratta's paternal aunt. In other words, the wedded children would be even more closely related than ordinary first cousins are, and there would be nothing strange in their resembling each other as brother and sister. However, it makes little difference whose daughter Nefertiti actually was. To history, she remains Akhnaton's beloved consort. It is curious to observe that her beauty, revealed in her famous limestone portrait-busts -- the loveliest masterpieces of Egyptian sculpture -- has made her far more widely known than her great husband to the modern European public at large. The two played together, sat and read or looked at pictures together, listened together to the stories that grown-up people told them. They admired together a lotus-bud that had just opened; they watched a velvety butterfly on a rose, or a flight of swallows going north with the coming of hot weather. A painted bas-relief, dating perhaps a few years later, pictures the prince leaning gracefully on a staff while Nefertiti gives him a bunch of flowers to smell. An indefinable sweetness pervades the whole scene, which we may plausibly take to be a faithful likeness of the young couple's everyday life. It is probable, too, that Prince Amenhotep soon initiated his child-wife into what could already be called his higher life. Whatever be her parentage, the worship of the Sun was nothing new to the little princess. But through her daily contact with the inspired child with whom she was now wedded, what had meant to her, until then, little more than a mere succession of grown-up people's gestures, became an act of personal love. Although his own ideas were yet far from definite, Prince Amenhotep probably taught her to see the Sun as he did, that is to say, as the most beautiful and the kindest of gods; we do not know if we should add, at this early stage of his religious history: as the only God worth praising. If Nefertiti be, as Sir Flinders Petrie suggests, the daughter of the king of Mitanni, then one may suppose that she told her young husband about Mithra and perhaps Surya, the sun-gods of her country, and that she described to him in a clumsy manner, putting too much stress upon details, as children do, some of the rites with which they were worshipped there. It is doubtful whether there could be in those details, as she presented them, anything impressive enough to be of psychological importance in the prince's evolution. But he may have seized the opportunity to tell the little girl, pointing to the fiery Disk in heaven, that this was the only real Sun, under whatever name and in whatever way one may praise Him in different lands. And she possibly felt that there was truth in his childish remarks, and began to look up to him as to somebody very wise -- wiser even, perhaps, than the grown-up people. Besides his administrative duties; besides the State functions, and occasionally the State banquets over which he presided -- like that one given in honour of Queen Tiy's visit to the new City, and represented upon the walls of the tomb of Huya -- besides even the daily worship he offered publicly at the altar of the Sun, pictorial evidence reveals to us different episodes of Akhnaton's private life which lead us to infer, about him and his creed, more than one could expect at first sight. In nearly every painting he is portrayed with his consort and often (as in the feasting scene just mentioned) with one or more of his six (or seven) children. And the attitudes in which he has allowed the artists to represent him, doubtless in a spirit of absolute fidelity to living life, are most eloquent in their naturalness. We have already recalled the lovely painted relief of the Berlin museum in which the young Pharaoh is seen smelling a bunch of flowers that Nefertiti gracefully holds out to him with a smile. On the walls of the tomb of Huya he is pictured seated, admiring the performances of several pretty naked dancing-girls, while the queen, standing by his side, refills with wine his golden cup. In the tombs of Mahu and Aahmose he is painted in his chariot, with Nefertiti next to him, and actually kissing her while he drives. Princess Meritaton, his eldest daughter, stands in one of those pictures in front of her parents, and plays with the horses' tails while the king and queen look lovingly at each other, their lips ready to unite. Even in scenes depicting State solemnities, such as the reception of the tribute of the empire -- scenes in which, one might think, there was little place for intimacy -- Akhnaton and Nefertiti are represented side by side, hand in hand, and with their arms around each other's waist. And, contrarily to the age-old custom of Egyptian artists, the queen is nearly always pictured on the same scale as her husband. One finds hardly less evidence of their great love in the written documents than in the paintings. Whatever be the inscription in which she is referred to, the queen is seldom named without some endearing epithet. She is "the mistress of the king's happiness"; the "Lady of grace"; "fair of countenance"; "endowed with favours"; "she at the hearing of whose voice the Pharaoh rejoices." And one of the most current forms of oath used by the king on solemn occasions -- the oath engraved upon the boundary-stones of the new City, and quoted in the beginning of this chapter -- is: "As my heart is happy in the queen and her children ..."
One has, therefore, to accept without reservation the conclusion that forces itself upon one's mind through both pictorial and written evidence -- namely, that Akhnaton loved his consort ardently. As we have said before, he had not chosen her, but had been wedded to her when about ten years old or less. The marriage was, no doubt, the work of Queen Tiy; and if Nefertiti was, as Sir Flinders Petrie maintains, the daughter of Dushratta, king of Mitanni, it was perhaps chiefly prompted by political motives. But as it often happens in the case of child-marriages, the little prince and little princess soon grew tenderly attached to each other and, as years passed, they unconsciously stepped from affection to love. In the inscriptions on the boundary-stones of Akhetaton, which were erected between the official foundation of the City and the time the king and court came to settle in it -- between the sixth year and the eighth year of the reign -- one, and sometimes two of Akhnaton's daughters -- Meritaton and Makitaton -- are mentioned. The third one, Ankhsenpaton, was born, according to Weigall, just before the departure of her parents from Thebes. Three others at least -- Neferuaton, Neferura, and Setepenra -- (and perhaps four, if Weigall and other authors are right) were born in the new capital. All six (or all seven) were Nefertiti's children. And there is no allusion of any sort to other children, or to "secondary wives," in the existing documents concerning the royal family; so that, as far as history knows, Akhnaton, in contrast with most kings of antiquity, and of his own line, seems to have been contented all his life with the love of one woman, given to him to be his chief wife while still a child. Not that he had, apparently, any prejudice against the customs of his times regarding marriage, still less against polygamy as a human fact. And it would be absurd to attribute to him the mentality of a modern European bourgeois on this much-debated subject of private morality. In this matter, as in many others, he seems to have been well in advance of our times -- not to speak of more prudish ages. And if he possessed but one wife, as repeated evidence suggests, this was not because he had any moral objection to polygamy, but simply because he loved that one woman with deep, complete, vital love. If we judge him through the pictures his artists have left of him, Akhnaton was far from being one of those austere thinkers who shun pleasure as an obstacle to the development of the spirit or even as a meaningless waste of time and energy. He seems, on the contrary, to have believed in the value of life in its plenitude, and the paintings that represent him feasting, drinking, listening to sweet music, caressing his wife, or playing with his children, apart from their merit as faithful renderings of everyday realities, had possibly a definite didactic significance. In practically every one of them the lofty symbol of the Religion of the Disk -- the Sun with downward rays ending in hands -- radiates over the scene depicted, so as to recall the presence of the One invisible Reality in the very midst of it, and to emphasise the beauty, the seriousness, nay, the sacredness of all manifestations of life when experienced as they should be, in earnestness and in innocence, and considered with their proper meaning. Whether they stand together in adoration before His altar, or lie in each other's arms, the Sun embraces the young king and queen in His fiery emanation; His rays are upon them, holding the symbol ankh -- life -- to their lips. For life is prayer. One who puts all his being in what he feels or does -- as he who "lived in truth" surely did -- already grasps, through the joyful awareness of his body to beautiful, deep sensations, a super-sensuous, all-pervading secret order, source of beauty, which he may not be in a position to define, but which gives its meaning to the play of the nerves. And he is able above all to acquire, through the glorious exaltation of his senses in love, a positive, though inexpressible knowledge of the eternal rhythm of Life -- to touch the core of Reality. In allowing a few scenes of his private life to be thus exhibited to the eyes of his followers -- and of posterity -- was it Akhnaton's deliberate intention to teach us that pleasure, when enjoyed in religious earnestness, transcends itself in a revelation of eternal truth? We shall never know. But one thing can be said for certain, and this is that the instance of that perfect man, on one hand so aware of his oneness with the Essence of all things, on the other so beautifully human in his refined joie de vivre, is itself a teaching, a whole philosophy. And in him one can see an expounder of precisely that wisdom which our world of to-day, tired of obsolete lies, is striving to realise, but cannot; a man who lived to the full the life of the body and of the spirit, seriously, innocently, in harmony with the universal Principle of light, joy, and fecundity which he worshipped in the Sun. Whether we imagine him burning incense to the majesty of the rising Orb, or listening to the love-songs of the day in midst of merriment and enjoying them with the detachment of an artist; whether we think of him entertaining his followers of the marvellous unity of light and heat, thirty-three hundred years before modern science, or abandoning himself to the thrill of human tenderness in a kiss of his loving young queen, the same beauty radiates from his person. And it is that beauty which, before all, attracts us to him, and, through him, to the Religion of the Disk, that glorious projection of himself in union with the Cosmos. The importance of Akhnaton himself as a living illustration of his Teaching cannot be overestimated. He was, it seems, fully conscious of it when, in his hymns, he gave to posterity such sentences as the following: "I am Thy Son, satisfying Thee, exalting Thy name. Thy strength and Thy power are established in my heart; Thou art the living Disk; eternity is Thine emanation (or attribute)...." "He" (i.e., Aton, the One God) "hath brought forth His honoured Son, Ua-en-ra (the Only One of the Sun) like His own form, never ceasing so to do. The Son of Ra supporteth His beauties"; or when he wrote the significant passage already quoted: "Thou art in my heart. There is no other who knoweth Thee except Thy Son Nefer-kheperu-ra Ua-en-ra (Beautiful Essence of the Sun, Only One of the Sun). Thou hast made him wise to understand Thy plans and Thy power"; or the following words, still more strange at first sight: "Every man who (standeth on his) feet since Thou didst lay the foundation of the earth, Thou hast raised up for Thy Son who came forth from Thy body, the King of the South and the North, Living in Truth, Lord of Crowns, Aakhun-Aten, great in the duration of his life (and for) the Royal Wife, great in majesty, Lady of the Two Lands, Nefer-neferu-Aten Nefertiti, living (and) young for ever and ever." These bold statements of his relationship to God cannot be understood in their proper sense unless one replaces them in their context, that is to say, in the whole system of ideas at the basis of the Religion of the Disk; especially unless one connects them with that hardly less bold assertion that the "Heat-and-light-within-the-Disk" and the Disk itself -- Energy and Matter -- are one. This having been proved correct as a result of modern scientific speculations (correct, at least, in the manner of an hypothesis which does actually account for the known facts) cannot be called "dogma." Yet, religiously speaking, as we have previously tried to explain, it argues the substantial unity of God (an impersonal God, of course) and Nature, visible and invisible; the existence of the same unchangeable Thing -- divine Energy -- at the bottom of all things visible and invisible, material and immaterial, which change everlastingly. In other words, for as much as one is able to infer from the hymns -- his only surviving works -- Akhnaton's Teaching seems to have been founded on an implicit if not explicit pantheistic monism. As we have already endeavoured to make clear in a former chapter, the young king's claim to be the Son of God (without his pretending, as other Pharaohs, to have been miraculously conceived from any particular deity) was nothing but the expression of the total consciousness he had of the presence of the ultimate Essence of all things within him; the assertion, repeated at various epochs, by the author of the Chandogya Upanishad and by the fully "realised" souls of all the world, that he "was That." What we wish to stress here is that, though he found nowhere around him anyone who possessed, like him, the knowledge of the Unchangeable within the transient, of Godhead within nature and within man, he was aware that this direct, sensuous, so as to say, experience of oneness was the goal of created life. And he was aware that he himself, who had reached it, stood apart from the average man -- as far apart from him, indeed, as he from the crowd of still less awakened sentient beings, if not further; apart from him, and yet linked up with him, as each definitely superior species is linked up with the less conscious ones that precede and condition its coming into being. He was a man -- physically conceived and born as all men -- and yet more than a man. He was, not merely in name but in fact, the Beautiful-Essence-of-the-Sun, since he felt that Essence, that indefinable Energy, running through his nerves; the Only-One-of-the-Sun, since he alone was aware of the real nature of the fiery Disk, while other creatures, though worshipping It, knew It but dimly or not at all; Akhnaton -- the Joy of the Sun -- since every new step towards more complete consciousness brought new joy (experience had taught him that), and since the Soul of the Sun, which is the Soul of the Universe -- the One without second -- became fully conscious of Itself within him; the Son of God, Who was alone to know His Father. As the visible Disk and the invisible, intangible "Heat and Light," the Energy within it, were one, so was he one with that same all-pervading Radiant Energy experienced within him. And he knew it. His nerves knew it. His body -- an atom of matter finally tracing its origin to our parent star (like all matter on earth) -- was aware of the Power within its depth; of its soul, which is none but the Sun's own Essence, which is God. God and created nature were one in him, Akhnaton, precisely because he was not, by a miraculous birth, set apart from nature, but was a man naturally conceived and born and reared. They were all the more one because he was, also, a man who, with both his exceptional intellectual gifts and his clear insight into eternal truth beyond the reach of pure intellect, lived to the full the happy natural life of all creatures. On the other hand, he could and he did live the natural life of the body and of the mind in perfect beauty and "in truth," only because he fully knew the higher meaning of it; because he was a "realised soul," a perfect Individual -- a Son of God. Now, perhaps, we can venture to explain what appears to be the strangest of those assertions of Akhnaton's divinity, to which scholars hardly ever refer in their comments on his religion save, at most, like Sir Wallis Budge, in a spirit of biased criticism which misses the point. The statement we are thinking of is the last one quoted in a preceding paragraph: "Every man who (standeth on his) feet, since Thou didst lay the foundation of the earth, Thou hast raised up for Thy Son who came forth from Thy body, the King of the South and the North, living in Truth, etc.... and for the Royal Wife, great in majesty, Lady of the Two Lands, Nefer-neferu-Aten Nefertiti, living and young for ever and ever." Taken literally, this would seem to indicate that Akhnaton believed all men to have been born and to have lived for himself and for his consort, from the dawn of the human race onwards, which is obviously not what he intended to say. But if, as we have tried to show above, the young Pharaoh was aware at the same time of his divinity as a fully conscious centre of Cosmic Energy and of his humanity as one who had human parents; and if, in his eyes, to reach that total consciousness of the divine within one's self was to exhaust the highest possibilities of our species (becoming one's self, so as to say, the culmination of it), then the amazing passage appears in a new light. It has a meaning, and a lofty one, too. It signifies that since the time, far-gone indeed, when God did "lay the foundation of the earth," the whole scheme of life has been steadily tending towards the creation of its supreme type: the God-conscious and therefore godlike human being -- the Son of God. It means that every individual man was born with latent possibilities of Godhead which he would generally not feel at all, or feel more or less dimly; which he would perhaps try to express, in art and life, but which the fully conscious superman alone -- the cosmic Individual, God and himself in one -- was destined to carry to their utmost realisation. And that Individual, aware of his real nature and "living in Truth"; that eternal Man in whose heart were "established" the "strength and the power" of the living Disk, was himself, the "King of the South and the North, Lord of Crowns" -- Akhnaton of Egypt, son of Amenhotep Neb-maat-ra, a very definite figure in time and space. He knew none who had, in his days or before, attained to a similar consciousness of their identity with the Soul of the Sun. And we, who have heard the names of several very ancient sages said to have realised Godhead within themselves, know not if they actually flourished before or after him, for their lives are not dated. It may be that some of them indeed preceded him in time. It may be that many more, of whom nobody has heard, preceded them. It may be also that Akhnaton was, in fact, the first man to realise "in his heart," to the full, the presence of that same hidden Energy which radiates in the Sun-disk -- that he was the forerunner, in a way, of a new species, superior to man. He is, at least, the first such one whose life can be followed step by step, with historical certitude, and dated with an approximation of but a few years. That idea that he was the culmination of an evolution which had begun with the "foundation of the world" was perhaps at the root of the public honours the young king seems to have rendered to his ancestors. We know that, among those to whom he erected shrines in his newly-founded sacred City, Akhetaton, were the great warrior-like Pharaohs of his dynasty, Thotmose the Third and Amenhotep the Second, the builders of the Egyptian empire -- staunch worshippers of the national gods, above all of Amon, to whom they consecrated the spoils of their conquests. No man could have been more alien than they to the gentle king who preached the doctrine of one nation, the earth, united in the love of one God, the Sun. And yet, they had their shrines, "each of which had its steward and its officials" in the City of the One God. 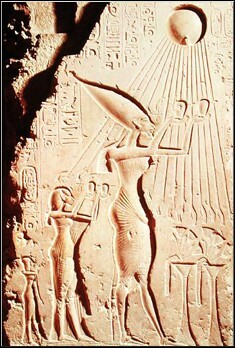 Arthur Weigall tells us that it was Akhnaton's desire to show, in this manner, "the continuity of his descent from the Pharaohs of the elder days and to demonstrate his real claim to that title of ‘Son of the Sun,' which had been held by the sovereigns of Egypt ever since the Fifth Dynasty, and which was of such vital importance in the new religion." But in the light of our comments on the true meaning of that title (which the Founder of the Aton faith would have claimed anyhow, because he had every right to claim it, even apart from his royal birth), it would seem that those temples to the memory of the dead Pharaohs were erected in quite a different spirit. An unbroken filiation to royal ancestors of a "solar line" two or more millenniums old could not add much weight to the claim to divinity of one who had experienced, through his nerves, the presence in him of the Soul of the Sun. While, on the other hand, if "all men" had gradually developed their possibilities only in order that he might finally appear, in the full-bloom of his individual Godhead -- if they had all been "raised up" for him, as he says himself -- then surely his own immediate forefathers were, in a still much more direct and effective manner, responsible for his coming. Whatever might have been the gap between them and him -- between their world and his, between their gods and his -- yet it remained a fact that they and not others had given him that body in the depth of which was rooted his true solar consciousness (not that of historical or legendary connections with any particular deity, but that of vital identity with the Radiant Energy of the One Sun -- the One God). They deserved their shrines, not for justifying any dynastic claims of his, but simply for being the human progenitors that had given birth to him, the godlike Individual, the Sun in flesh and blood. One more point, however, clearly referred to in the passage quoted a few pages above from the Longer Hymn, seems to need explanation, and that is the place given by Akhnaton himself to "the Royal Wife ... Nefer-neferu-Aten Nefertiti" in the Religion of the Disk. There can be no doubt that the person here mentioned is actually the Pharaoh's consort, the beautiful young queen whose portrait-busts in the Berlin Museum are perhaps the most widely admired of all the masterpieces of Egyptian sculpture. Her titles -- "great in majesty, Lady of the Two Lands, living and young for ever and ever" -- only confirm her identity. And no explanation of any kind can be put forward to account for this allusion to her, save that the Founder of the Aton cult wished to say that which he said, i.e., that he believed the evolution of man to have culminated in himself (the only man he knew to be God-conscious) and in her. The question is therefore: on what grounds was she, in his eyes, entitled to such an exalted position in the hierarchy of creatures that "every man who standeth on his feet" since God "did lay the foundation of the earth," had been "raised up" for her, no less than for him? In other words, of what significance was she in his Teaching, and in what light should she be looked upon by those who wish to be his followers? From all available written and pictorial evidence it appears, as we have already seen, that Akhnaton and Nefertiti loved each other dearly. If the young king had taken no "secondary wives," as had been the custom with his fathers, it was simply because, in this one queen of his and in the children her love had given him, "his heart was happy," as he himself declares in so many inscriptions. The extraordinary importance he seems here to give his consort may be just a proof of how deeply he felt all that he owed to her. From what one knows of his earnest and sensitive nature, one may infer that he understood better than any other man the supreme value both of tenderness and of pleasure. It is difficult -- and it would be perhaps indiscreet -- to attempt to say more. Akhnaton is one of those rare characters so admirably balanced and beautiful that they should be felt rather than discussed. And average imagination, which dissociates the spiritual from the physical and the emotional planes instead of comprehending them in their organic continuity, will probably always remain unable to conceive what that sacred intimacy with his queen (faintly reflected in a few attitudes upon the bas-reliefs of the time) actually meant to him, whose body and soul were in tune with each other and with the silent music of Life. 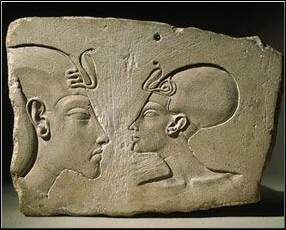 The young Pharaoh knew how profoundly the woman who loved him and whom he loved was one with him. And just as he had ordered her features to be represented upon the monuments along with his, and on the same scale, so did he bring in her name and titles, along with his, in the bold statement that he was the Man for whom "all men" had been "raised up" from the beginning of the world. He could not conceive of himself apart from her. We may think that he would have been anyhow the perfect individual whom he was. But he probably believed that, without her, something vital would have been missing in his life. He had needed the warmth of love she had given him, and all the knowledge he and she had acquired together, in their love, to become complete. And therefore, in none of his highest claims did he consider himself alone. He was "he and she." In him, the perfect Individual reflected and expressed the godlike Couple, for ever one, in divine union on all planes. This is one interpretation of the meaning of the place given to Nefertiti in the above quotation. There is another. The "Lady of the Two Lands" may perhaps be considered here not only as the Wife, inseparable from Akhnaton himself -- "one flesh" with the conscious flesh of the Sun -- but also as his best disciple, the model and prototype of all those who wish to follow him. And "all men," it may be suggested were "raised up" for her in the sense that her approach to eternal truth, through the simplicity of a loving heart, corresponded to an essential stage which they all had to reach before being able to experience within themselves the immanent Soul of the Sun. Not enough is known of Nefertiti for one to say if she was or not a disciple as "intellectual" as some others might have been -- one who could have explained the Teaching rationally, or even written philosophical comments upon it. But she certainly was one who accepted it wholeheartedly and put it at the centre of her life, both because she deeply felt its beauty and because she deeply loved its inspired Promoter. Devotion had doubtless led her to the very gates of knowledge, if not to knowledge itself. And, in stating that from the beginning of the world "all men" had been "raised up" for himself and for her, Akhnaton has perhaps simply wished to stress how far advanced in the human evolution is the real Disciple -- the devotee who gets a glimpse of ultimate truth through his (or her) absolute love for a God-conscious being and for the Sun, God's visible Face, if not for the divine impersonal Energy that resplends, though in a different manner, in both of these. Of those who had attained the higher stage of complete consciousness of their identity with the Essence of the Sun, he knew none but himself. He has said so: "Thou art in my heart and there is none who knoweth Thee save Thy Son, Nefer-kheperu-ra Ua-en-ra...." But he knew at least one whose sincerity and wholeheartedness contrasted with the lip-homages of most of his followers, the superficiality or actual indifference of many of which he was probably beginning to become aware; one who, through intense devotion, had transcended herself and was, even without having his direct knowledge of the supreme "Heat-and-light-within-the-Disk," nearer to him and nearer to It than any other. And that one was his consort -- the same individual whose love had perhaps played its part in the awakening of his own deeper consciousness. It is possible that by declaring "all men" to have been "raised up" for her as for himself, he was alluding to her devotion as typical of a true disciple's; of one, that is to say, who is on the way to attain the goal of man that he had attained. It is also possible that he simply meant that she was inseparable from himself, the God-conscious Man. But we believe that, still more probably, the two interpretations can be put forth at the same time as complementary. The former may, in a way, be the consequence of the latter in the particular case of Queen Nefertiti who was first Akhnaton's consort and then only his devout disciple. The latter, in turn, is not independent of the former, in the sense that the beautiful "Lady of the Two Lands" was perhaps such a perfect wife precisely because she was her lord's disciple and collaborator -- one with him on all planes, as we have said. And that oneness on all planes with a God-conscious Teacher is perhaps the highest stage which can be reached by all those to whom is not given, here and now, the direct experience of Godhead within life. The world is therefore "raised up" for the few who reach it, as well as for the fewer still who, like Akhnaton, go further beyond. The preceding text is excerpted from Savitri Devi's A Son of God (London, 1946), pp. 34-37, 97-101, 202-206. The title above is editorial, and Savitri's footnotes have been removed. Contemporary Egyptologists would revise some of the biographical data in this selection: (i) Nefertiti was likely in her early teens at the time of her marriage, Akhnaton several years older; (ii) it is now known that Akhnaton did indeed have a secondary wife, Kiya, the probable mother of the pharaohs Smenkhkare and Tutankhamen ("King Tut"). Kiya, who was never designated "King's Wife," Nefertiti's title, may have died in childbirth in the 12th year of Akhnaton's reign.